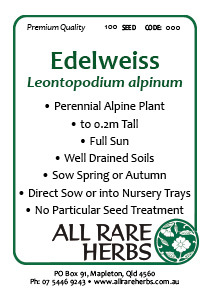 Edelweiss, Leontopodium alpinum, is the famous alpine wild flower of Europe. Apart from ornamental uses, the plant has traditional uses as a remedy to respiratory problems such as tuberculosis. Modern usage includes the cosmetic industry for the prevention of wrinkles, and for the treatment of age related varicose veins, haemorrhoids and other vascular problems. Edelweiss is native to mountain regions of Europe and prefers light to heavy soils with free lime, in an open sunny position. Frost resistant but drought tender. A perennial plant, growing to 0.2m x 0.25m. Clusters of whitish, star-like flowers in spring. Be the first to review “Edelweiss, seed” Click here to cancel reply.